The V-Cone Meter comes into its element when space is an issue. With minimal to no upstream or downstream required for measurement. The V-Cone has the same benefits of the Venturi and is a useful meter on Platforms or FPSO's where space is a virtue. 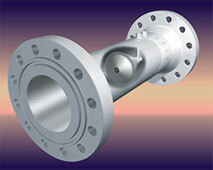 The Cone element is precision machined and fabricated to ensure accurate metering.